H-IIA Launch Vehicle No. 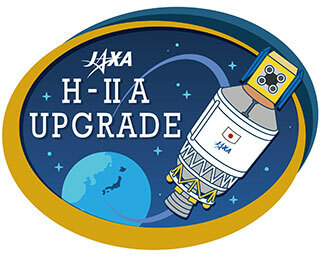 29 (H-IIA F29) incorporates the outcome of the H-IIA UPGRADE that focuses on upper stage modifications to launch satellites more flexibly than ever. The “geostationary orbit” is about 36,000 km above the Earth’s equator. The orbit is used by meteorological and communication satellites. 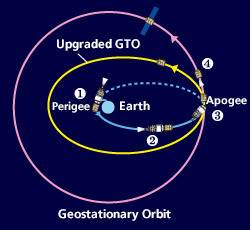 For entering into the geostationary orbit, a satellite is injected into the “geostationary transfer orbit (GTO)” by a launch vehicle. To date, a satellite has to fly to the geostationary orbit by its own thrust (in other words, by using its onboard engine consuming its loaded propellant) after being inserted into the GTO. Long-Coast (Improving the launch vehicle engine for longer space flight) and multiple-time ignitions enables us to inject a satellite into a closer point to the geostationary orbit. By placing a satellite into the orbit closer to the geostationary orbit, less propellant is necessary for the satellite to move to the final destination, thus the volume (weight) for that unnecessary propellant can be used for a larger observation sensor or extra propellant for longer satellite life. During space flight, the launch vehicle is constantly heated by the sun and the liquid hydrogen (which is about minus 250 degrees Celsius) in the tank evaporates. By coting the tank surface with special white paint, the tank surface reflects the sun light to reduce propellant evaporation to contribute to Long-Coast. To ignite the engine, the turbo pump has to be cooled using liquid oxygen. We have developed a new cooling system called the “trickle pre-cooling” to significantly reduce the consumption of liquid oxygen during Long-Coast so that more liquid oxygen can be used for engine operation. When one specific side of the launch vehicle is constantly hit by sunlight, the temperature of only that side goes up. By slowly rolling the launch vehicle like a (barbecue (BBQ) roll) while maintaining its attitude vertically against sunlight, we can keep the temperature of all parts of the launch vehicle constant. During the Long-Coast, propellant has to be held at the bottom part of the tank to avoid propellant evaporation as much as possible. For that, the propellant for attitude control (Hydrazine) used to be emitted backwards. In the case of Long-Coast, the volume of Hydrazine will not be enough; therefore, in the new system, evaporating propellant will be effectively used. We developed a large-size lithium ion battery to secure power for avionics during the Long-Coast. A high performance antenna is also installed on the launch vehicle for assuring communication with the launch vehicle even from 36,000 km away to acquire flight status data from the vehicle, such as the engine operation status, even when it reaches near the geostationary orbit. The speed of the launch vehicle near the geostationary orbit (apogee) is slow, thus, if the second stage engine is ignited to full power (100% thrust), it is too powerful to precisely inject a payload into the target orbit. Therefore, we added a function called the “throttling function” to control the second stage engine thrust to 60% so that more flexible orbit insertion becomes possible. 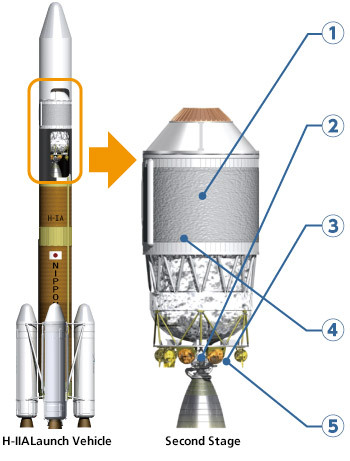 Ignite the second stage engine (second time) at the perigee to increase speed. Long space flight (“long coast”) for about four hours without separating the second stage and a payload. Ignite the second stage engine for the third time at the apogee to increase speed, and separate the payload to inject it into the upgraded geostationary transfer orbit (upgraded GTO). The payload increases its speed at the apogee and enters into the geostationary orbit.